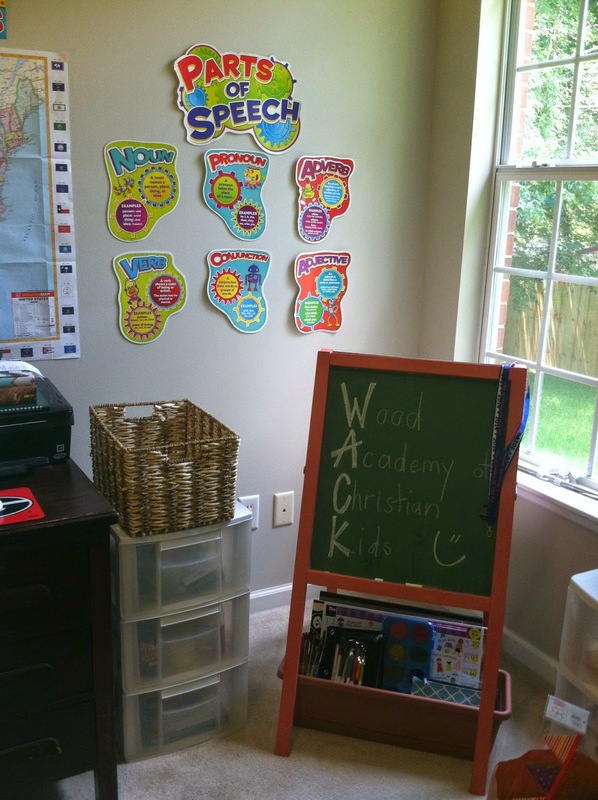 It’s difficult for me to wrap my mind around the fact that we are beginning our FOURTH year of the Wood Academy of Christian Kids (W.A.C.K.) in only a few, short weeks! From day one, I have been a disciple of the wonderful Charlotte Mason and her approach to learning and educating the whole child. You can read up on who she was and her philosophy here. 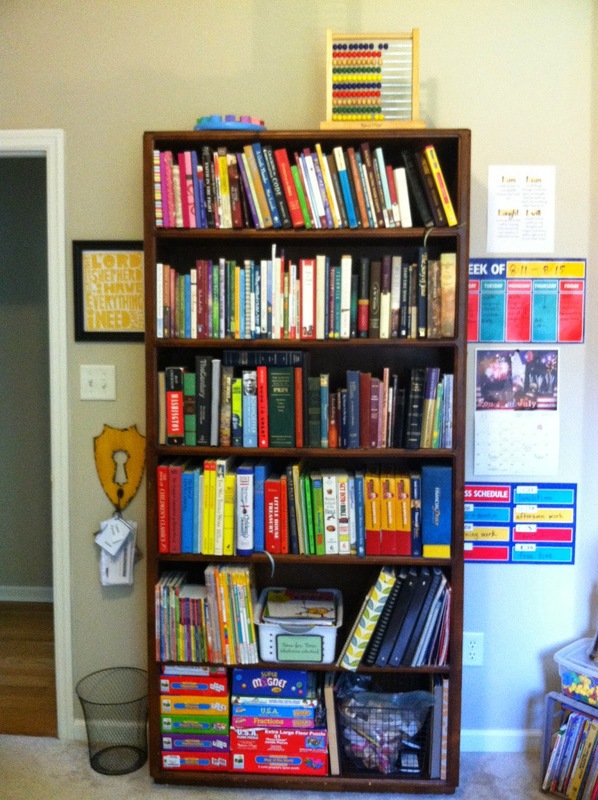 One of her primary beliefs is that we as parents/educators should set a feast (of learning) before our children. One of the ways I do this is to really create a big buzz about school starting back. I start sharing the vision for our school year with Thomas, Mae, and Kate. I start dropping hints about major units of study we will cover. I begin researching cool field trips that will correlate to our studies. 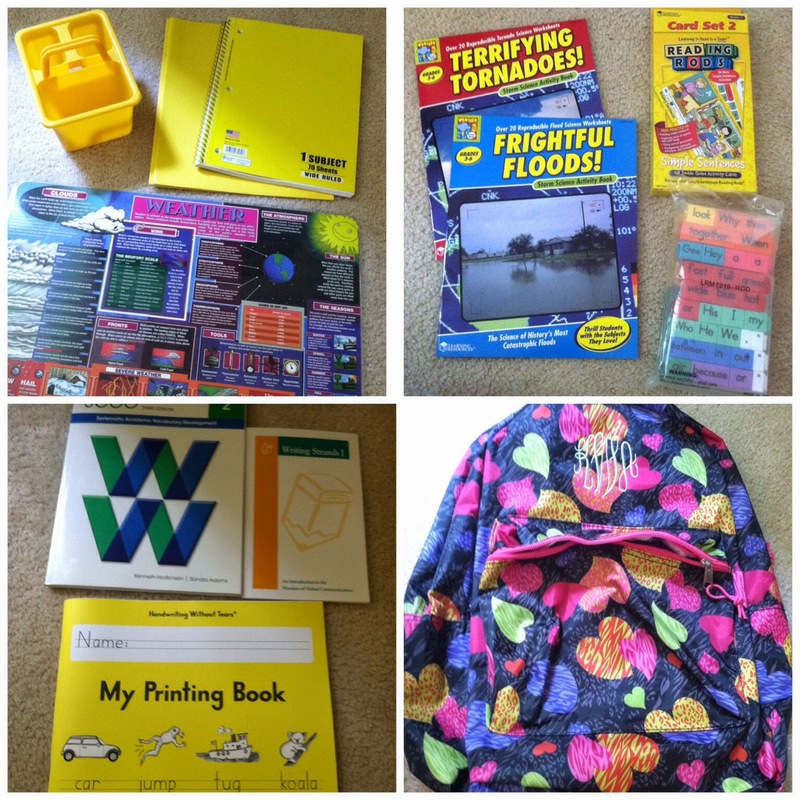 But the thing my kids LOVE the most has to be our annual tradition of Back-to-School Baskets. I started small our first year and gave the baskets to the kids on our official first day, complete with cupcakes. Here’s that day back in 2011. My how our kids have grown! Also. Those first baskets were weak-sauce. 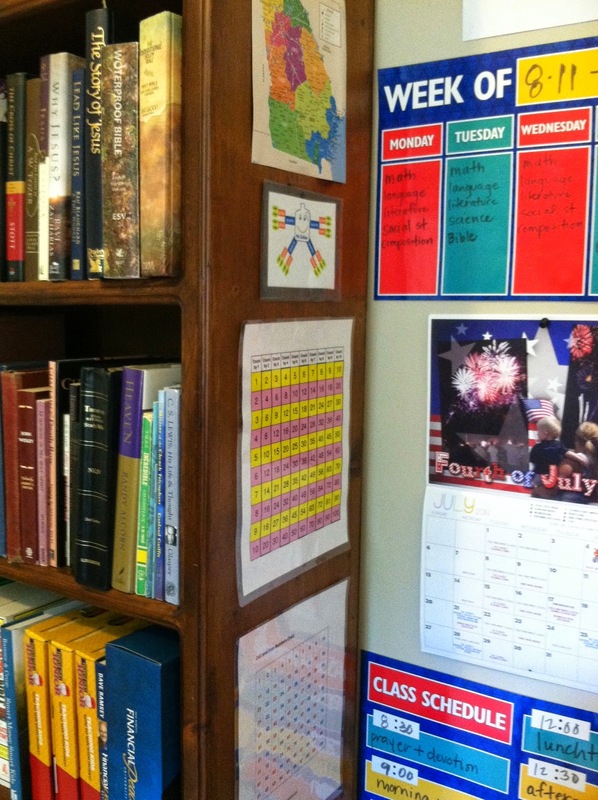 In 2012, I did a six part series documenting how I use my summer to prepare for the coming school year. 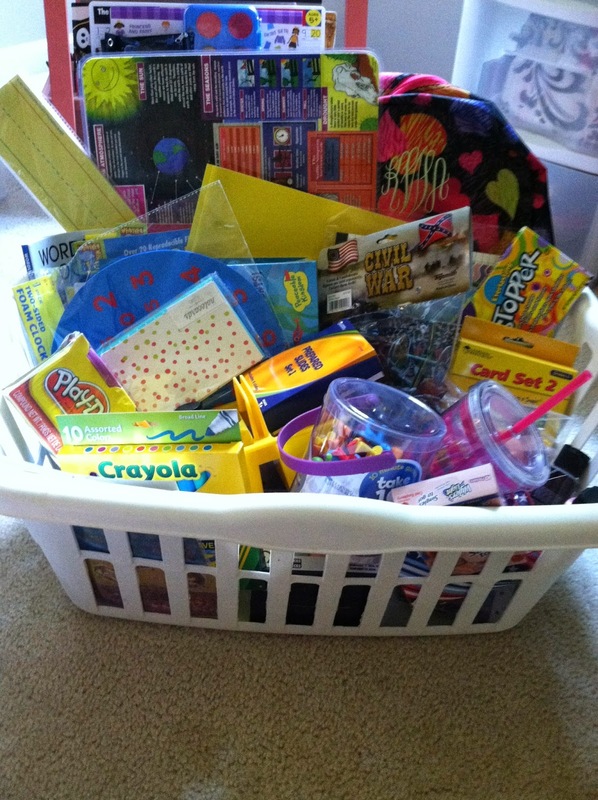 The final installment included some photos of the kids’ 2012 Back-to-School-Baskets. You can see that post here. Last year, I was limping across the finish line of the deployment and we ended up starting school in July to accommodate fall travel plans upon Ryan’s return. 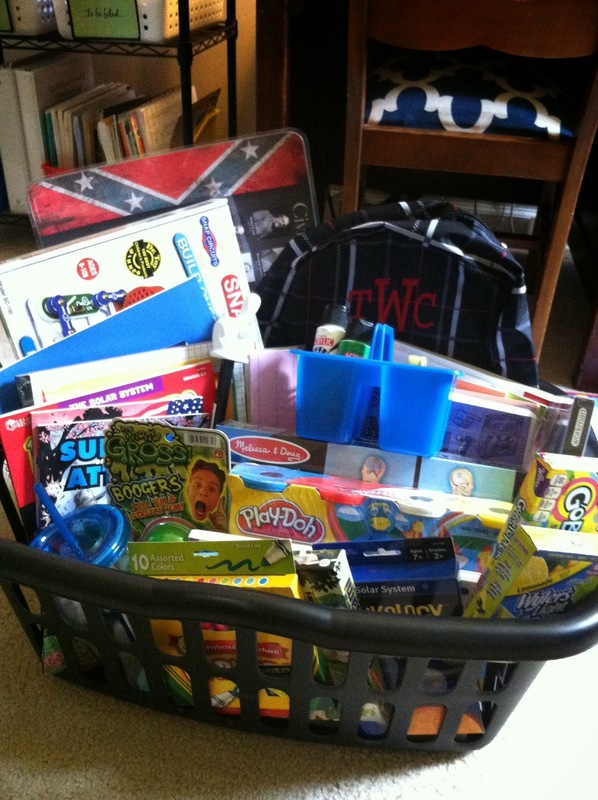 You can see pictures of our Back-to-School Baskets for 2013 here. It was the best of times and it was the worst of times. 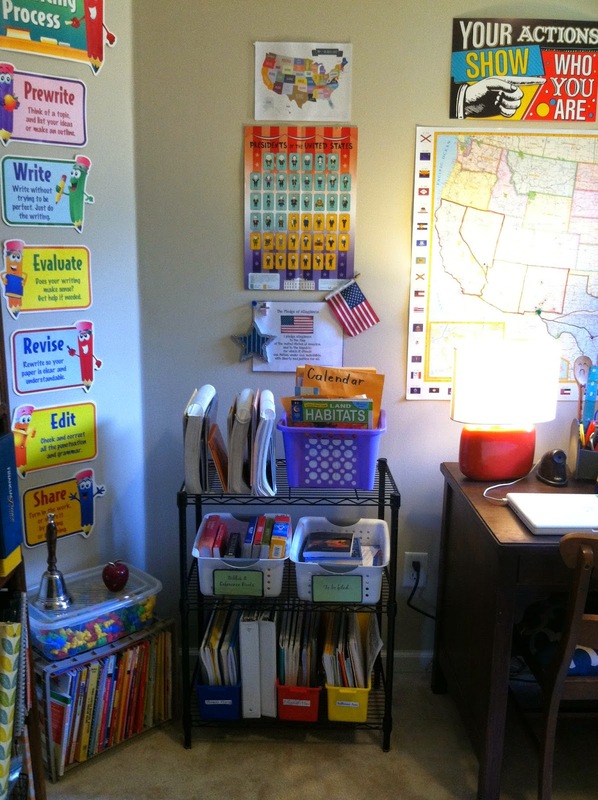 And this year, despite another big move, relocating to Georgia, having a plenty-full summer already, I’ve been all abuzz with excitement about this coming school year since before we left El Paso. 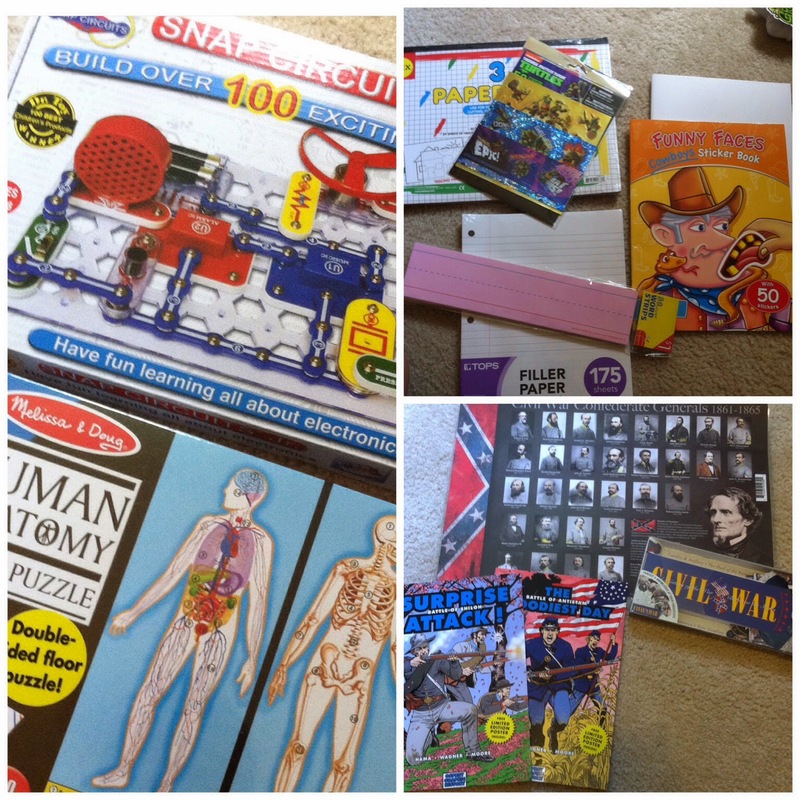 Last school year I did a full post with links on our curriculum for 2013-2014. 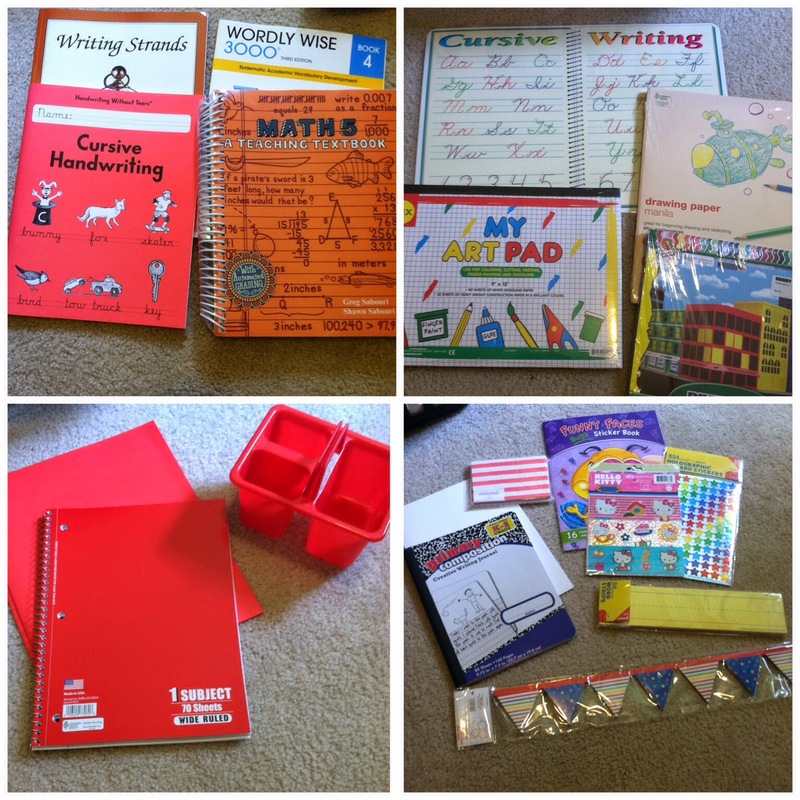 Most all of what we are using is exactly the same this year just up a level for each of our students. Anyway, my kids are practically foaming at the mouth to get a hold of these baskets. They don’t know specifics but they have seen small bits and pieces here and there and I’ve been taunting and tormenting them with clues and hints. Who knows if I will have the courage and backbone to make them wait two more weeks. 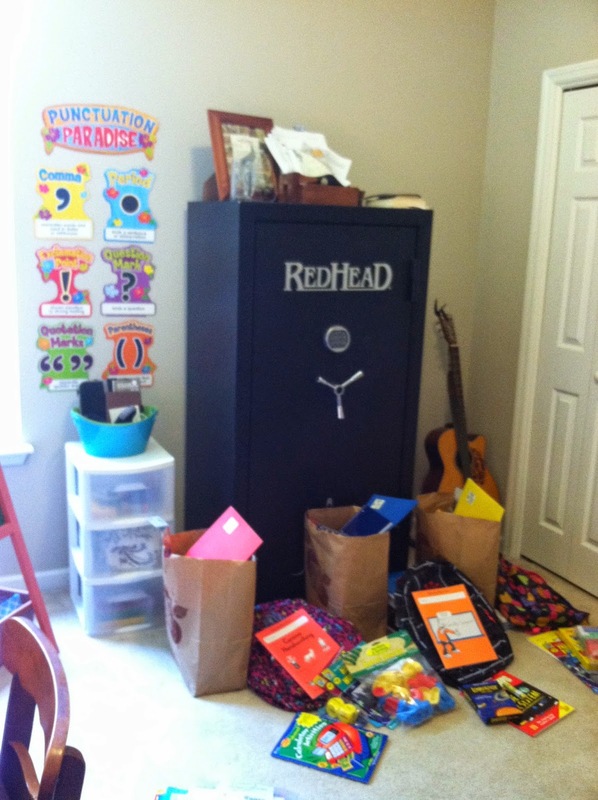 I’ll start with a few snapshots of our office/home school room/ Ryan’s hunting closet and safe-room. 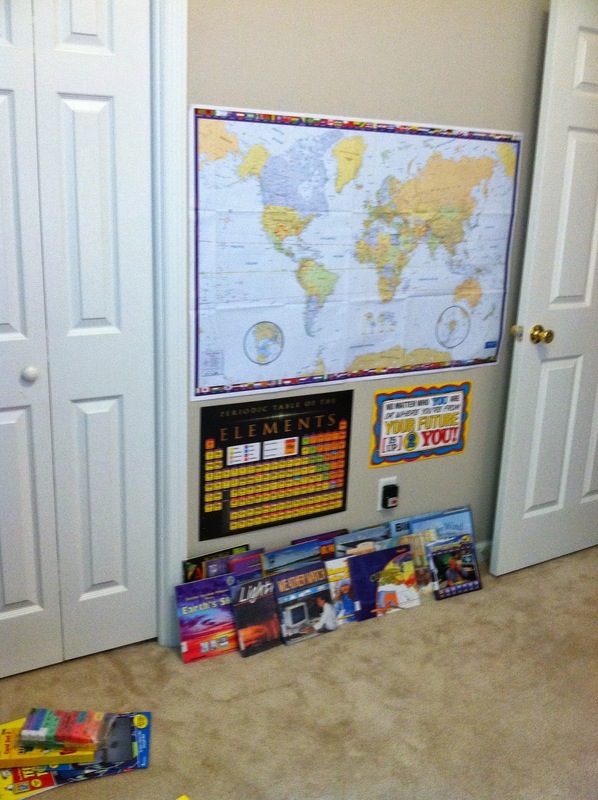 For the past three years I did not have a dedicated room for home school stuff. I’ll stick to my guns and say for sure that you do not need a room. 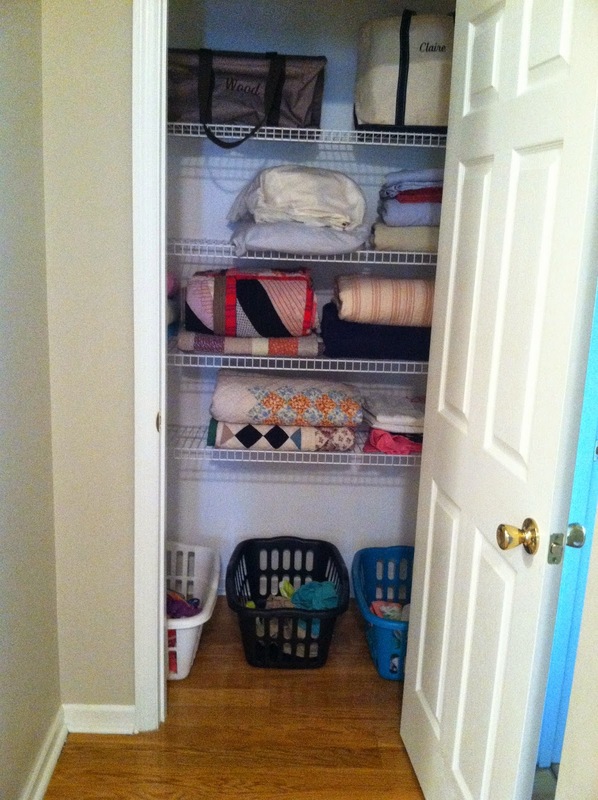 I used a small downstairs closet to store nearly everything that is now in this room. 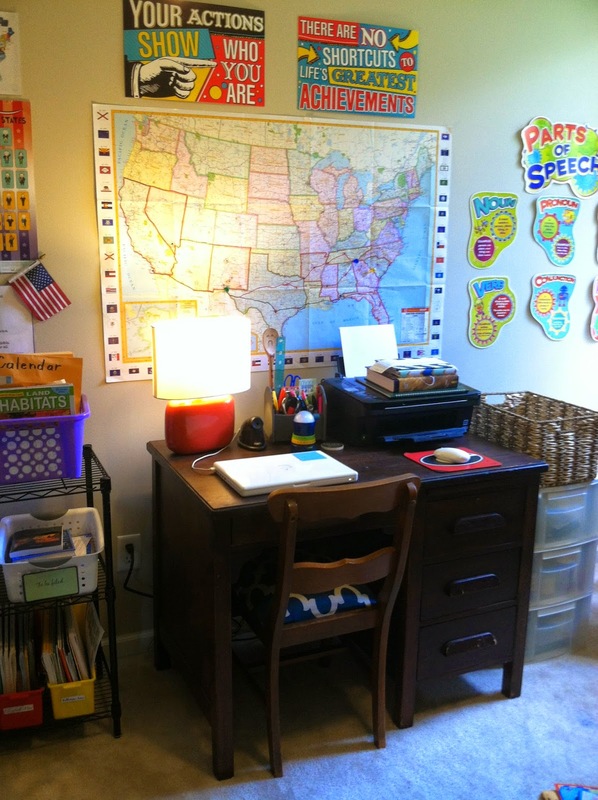 We worked at the kitchen table, the kitchen island, the den floor and at this desk (pictured) tucked away in the corner of our laundry room. I feel very blessed to have this space now so we can spread out and display and store stuff and shut the door so no one can see it. I have a feeling we’ll still be working at the kitchen or dining room table, in the den floor or somewhere else besides this room. 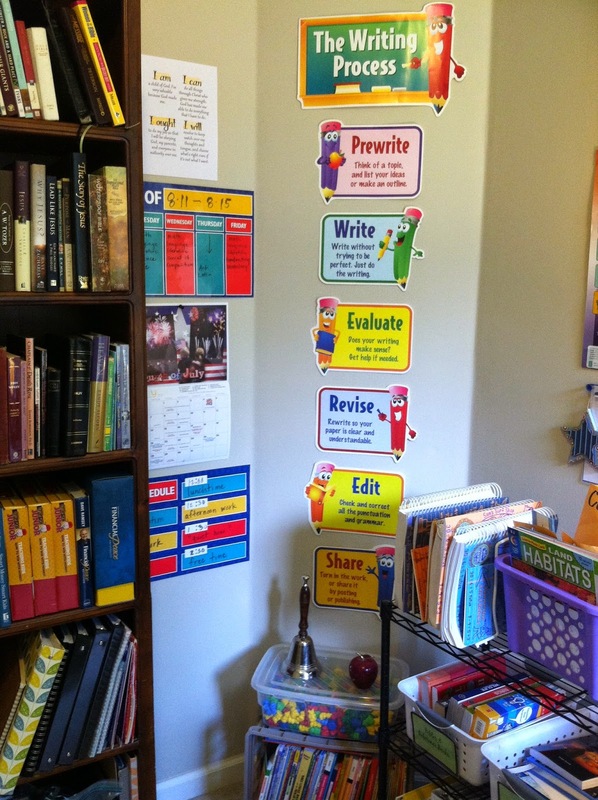 I never was an elementary school teacher so I know my little posters and attempt at color and visual stimulation won’t be getting any pins to Pinterest. In fact, I know it all looks a tad pitiful, but I’m no Mrs. Lippy and for the most part you just can’t teach an old dog, new tricks. 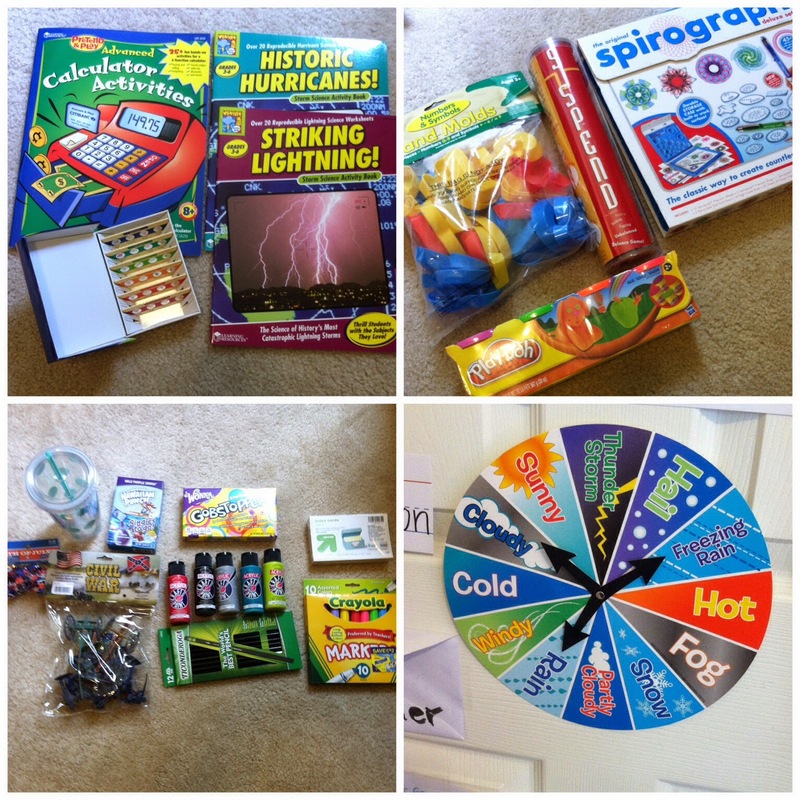 Our first science unit is a study on climates and weather. 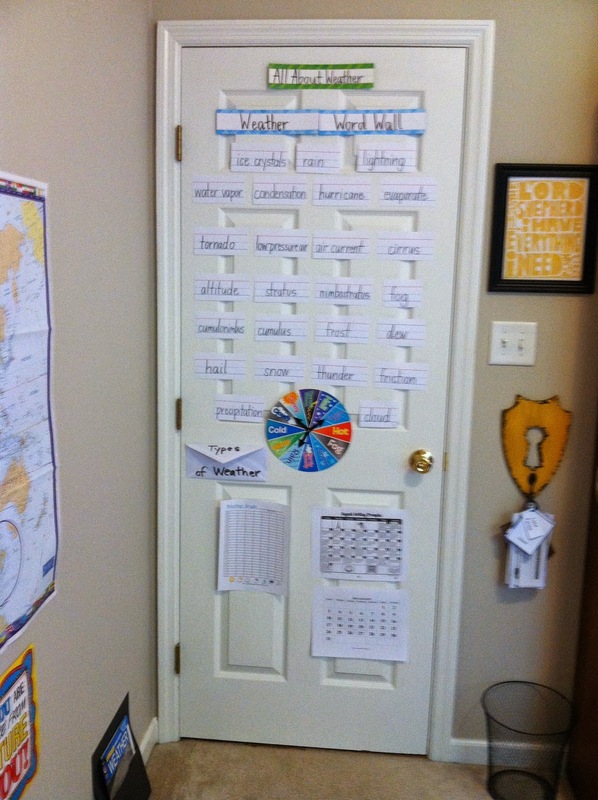 I’ve already got a few things up on the back of the door and some library materials hoarded collected. I have been collecting little things here and there since before we left Texas, but I’d say the majority of this stuff I’ve gotten over the past month that we have been here. 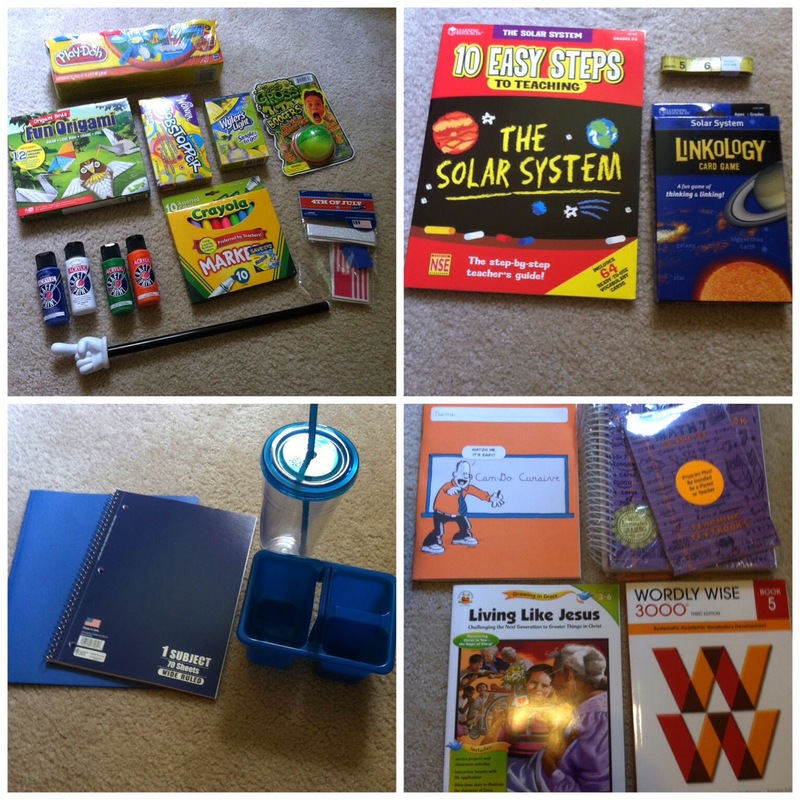 I won’t get into great detail about exact items but will, instead include a list of places I shop. 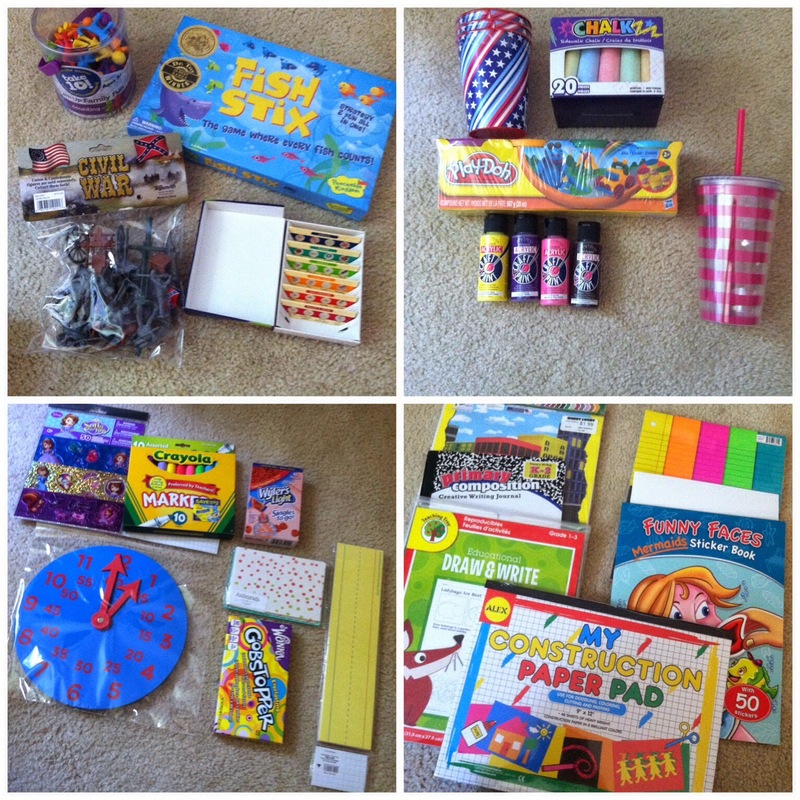 Most things were very inexpensive, you just have to look in the right places for the best deals. 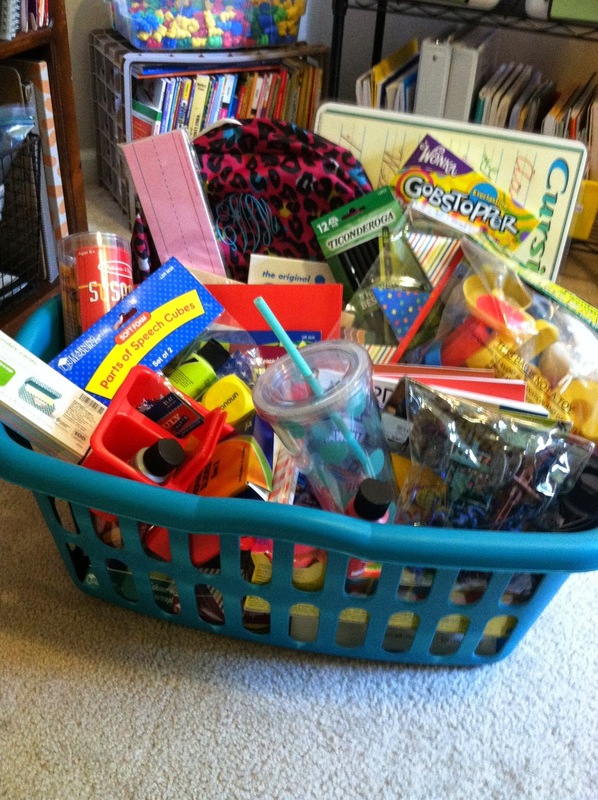 Also, I will say that since I don’t have to buy uniforms, dress code appropriate clothes, pay school fees or tuitions, or buy school supplies for the teacher, I *totally* justify the expense of these baskets. 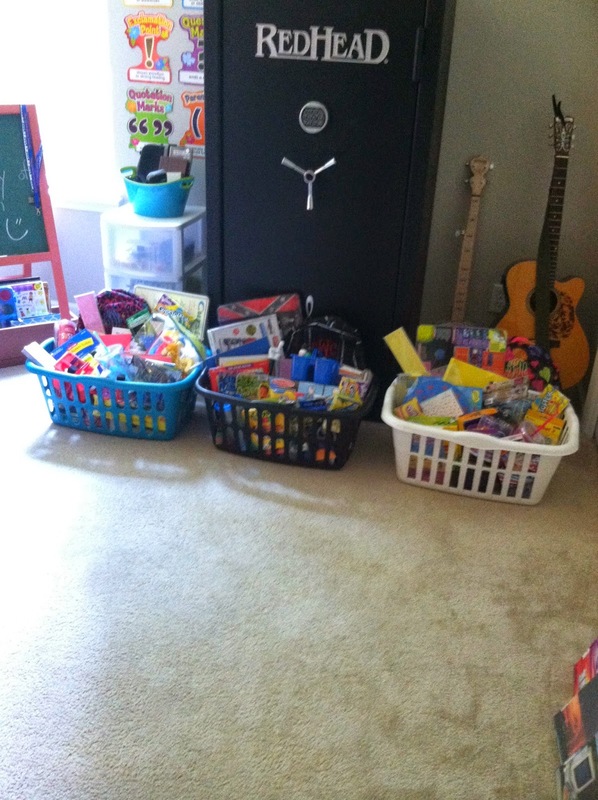 This year, I had to upgrade to the kids’ laundry baskets to fit everything in one place. Their dirty laundry is currently in the floor of the hallway closet. 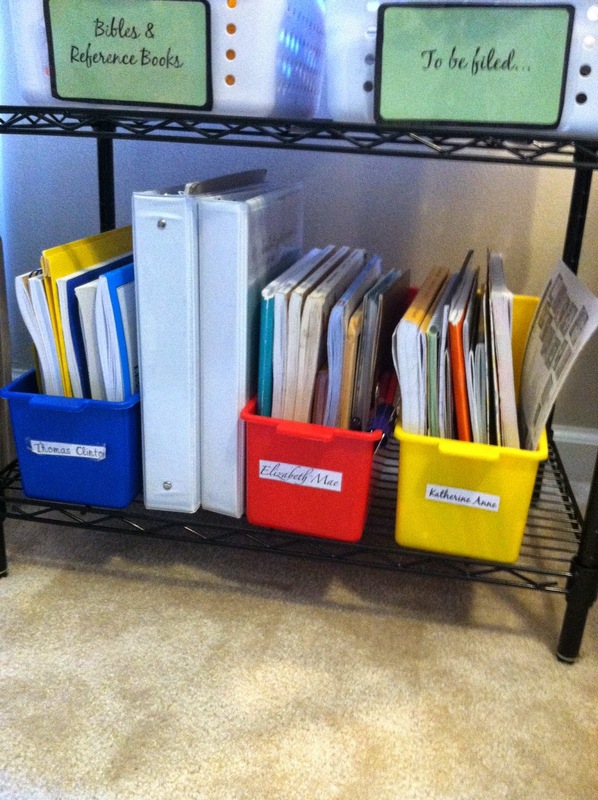 I guess I’ll probably give them their school stuff sooner, rather than later. Here’s to helping to spread a feast and light a fire within my little learners. And here’s to hoping I can hold out and make them wait. Or not. Here’s to our best year of the Wood Academy of Christian Kids yet! We all hope to make it a great one!